At Royal Holloway, University of London we benefit from a wealth of staff expertise on Magna Carta and our beautiful campus is located just a stone’s throw from the Runnymede meadow where Magna Carta was sealed. We have held an annual Magna Carta Lecture since 2005 in partnership with the Magna Carta Trust and the final lecture in this compelling series will take place in June 2015. You can celebrate 800 years of Magna Carta with us by joining in with a host of exciting activities and events. Through the generous support of The Leverhulme Trust, Royal Holloway, University of London has created The Leverhulme Magna Carta Doctoral Centre for Individual Freedom. The Centre will enable a team of doctoral students to work, across disciplinary boundaries, to generate research, thinking and public debate about the relevance of Magna Carta today. Click here for more information. Join us at Royal Holloway, University of London on Sunday 14th June from 10am-5pm for a free festival of art and ideas. The festival will be a celebration of the legacy of Magna Carta with festival goers able to explore the history behind it and take a creative and critical look upon the themes of justice, freedom and rights. There will be something for all the family in this summer fair with a radical twist. The unique and diverse cultural programme will feature art and music, talks and workshops, dance and drama. Watch the stories of eight influential people throughout history come to life with the amazing performance of the Giant Puppets created by school children from all over Surrey. Marvel at the engaging show by Stan’s Cafe which will depict the UK’s population as 1,068kg of rice, providing lots of thought provoking statistics which will leave you astonished. Take a journey through history with Christopher Lloyd and his 8 metre long timeline which explores 800 years of liberty and freedom including women’s rights, the Black Death and freedom of speech. At 3pm its time for tea! Join us for a cup of your favourite quintessentially British beverage and a debate about the rights and liberties that have been fought for over the last 800 years. Come and view the beautiful hand crafted Magna Carta quilts. Located in the Windsor building, these eight quilts depict both the medieval and legacy stories of the Magna Carta. On the back of the quilts you can see aerial view of the Thames between Windsor and Staines which is where Runnymede meadow can be found. See the Disability Arts in Surrey (DAiSY) group showcase elements of their exceptional projects in music, drama and art which closely align festival themes of rights, equality and freedom of expression. View a stunning exhibition of seven paintings by Alan Perriman depicting the landscape of the Magna Carta and Runnymede as it is today and also how it has looked at different times. 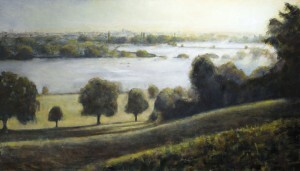 Amongst others the collection shows interpretations of the floods throughout Runnymede, the view from Cooper’s Hill and the marsh. Watch the spectacle that is the twelve minute snapshot of the Freedom Game Opera. Performed at the Royal Albert Hall in May by Surrey residents, the opera tells the dramatic story of a Surrey family and their quest to win back the freedoms that are taken from them during a computer game. Dress up in period costumes and discover what it felt like to wear the different clothing and fashions throughout history. Don’t forget to get a picture! Listen to Hew Locke give an informative and intimate talk about his artwork due to be unveiled by HRH the Duke of Cambridge on the 15th June. Find out about what inspired him to design and craft the exciting piece of artwork. Play ‘spot the Knight or Dame’ whilst wandering round festival as over 20 members of the Knights Templar will be dressed up in costume. They will be bringing with them lots of historical memorabilia associated with Magna Carta, so feel free to drop by and take a look! As well as this there will be lots of opportunities to get involved in the celebrations, with hands on workshops, listening to local musicians, sampling food and drink, wandering through the crafts market and lots more. For further details of the full programme please visit royalholloway.ac.uk/greatcharterfestival. We look forward to welcoming you to what will be a fun filled and awe inspiring day! As part of the University’s Great Charter festival, there will be an exhibition of paintings celebrating the landscape of Magna Carta. “Runnymede Ghosts” explores both Runnymede and Ankerwycke as they are today, while highlighting how their histories are still visible, giving clues as to how they looked when Magna Carta was signed. The exhibition is by artist Alan Perriman who is based at Runnymede. 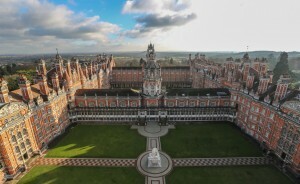 It will be in the Windsor Building at Royal Holloway, University of London, Egham from 12-16 June 2015. “The meadows of Runnymede have been a focus for human activity for 3000 years. Each era has re-invented the area, changing its use and modifying the landscape without ever quite obliterating that which had gone before. This process continues today and has created an area of incredible richness and diversity. After a resounding success, the Royal Holloway, University of London Magna Carta MOOC will be running again in JUne. -To see the course page, click here. Download our free app and unlock the fascinating world of Magna Carta. Created by students, the app features eight trails exploring paths around the Runnymede site. It includes a Children’s Trail, a History Trail, an Ecology Trail and more. Click here to find out more. The Surrey branches of the National Association of Flower Arrangement Societies (NAFAS) will stage a Magna Carta themed flower festival open to the public from 10am to 4pm Friday 12 June – Tuesday 16 June, with a late night opening on 16 June in the Chapel. Displays will depict the shields of the 25 Barons and the coat of arms of the Charter Towns. Students will photograph the festival as a competition for students, creating a lasting legacy from the event. Photos will be hosted on the NAFAS, Royal Holloway, University of London and Runnymede Borough Council websites. Find out more about Royal Holloway, University of London’s involvement in the Magna Carta 800th Anniversary – click here. Lectures across Britain throughout the year, from Professor Nigel Saul. 14th March – The Final of the Historical Association’s Great Debate. The debate with the question, ‘What does Magna Carta mean to me?’, will be held in the Picture Gallery at Royal Holloway, University of London..
24th April – Magna Carta Constitutional Convention, devised by Egham Museum, sponsored by Eton and Wellington Colleges and supported by the Supreme Court, Amnesty International, Royal Holloway, University of London, and Brunel University. 80-100 15-18 year old students attend to debate and draft a modern Magna Carta to be exhibited in the Supreme Court. 12th – 16th June – Alan Perriman exhibition at the Windsor Building, Royal Holloway, University of London campus. 12th – 16th June – Magna Carta in Flowers: flower festival open to the public between 10am & 4pm, with a late night opening at the University chapel on the 16th. 16th June – Annual Magna Carta Lecture. The Rt Hon Jack Straw will be speaking.